This is the second 7" Superchunk has released leading up to their new album scheduled for release in February. Break The Glass was a limited 7" available in two versions, the first was on standard black vinyl, limited to 700 copies. This one was $15. The second version, and the one I decided to buy, is on yellow vinyl and was limited to 290 copies. The yellow vinyl version was also autographed by all four members of the band and was sold for $30. Now, both price tags are somewhat steep for a 7", but all proceeds from were being donated to Southern Poverty Law Center. So, I was really just donating to a good cause and getting a limited 7" as a bonus. I can't say that autographed records are anything that I care all that much about, but having the limited colored vinyl version is, so it didn't take that much thought to snag this version. The A side of the 7" is "Break The Glass,." It will also be on the upcoming full length. All in all it's a great song. It leans on the upper end of mid tempo with some high pitch lead guitar riffs over the trademark Superchunk fuzz. The chorus actually drops the energy of the song a bit the first time it's rolled out, but this adds a really cool dynamic to the song. Plus, things become very loud and triumphant when that chorus is used again towards the end. The B side is "Mad World," which according to the liner notes is a Corrosion of Conformity song. I don't know any Corrosion of Conformity songs and this Superchunk version isn't anything that would make me seek out their stuff. It's louder than your usual Superchunk with gritty/screaming vocals and a pretty basic verse/chorus song structure. I guess it's OK as a B side novelty, but it's not really the sort of thing I see going back to very often. 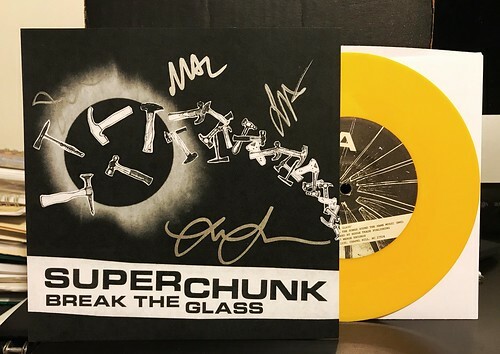 But, it is important to me to keep my Superchunk 7" collection complete and "Break The Glass" absolutely has me ready for the new Superchunk album next year.